The Minnesota Pork Board recognized the Boerboom family of Marshall, Minnesota, as this year’s Family of the Year award recipient on February 4, 2019, at the Hilton Minneapolis. It is rare to find a pig farming family as unique as this year’s Family of the Year award winners. 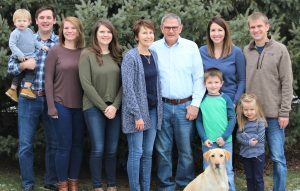 Greg and Paula Boerboom, along with their three children, Laurie, Mike, and Matt, all work alongside each other every day on their growing operation, Boerboom Ag Resources, LLC. Their farm started out as a family farm in the 1930’s when Greg’s parents began farming. The farm was incredibly diversified with an array of animals including chickens, dairy cows, beef cattle, and pigs, along with many others. Though Greg and Paula still live on the original homestead, the farm has changed drastically over the years, now specializing in raising pigs and farming the land. Each member of the Boerboom family holds a specific, prominent role in the company’s operations. Greg oversees all of the day-to-day operations and makes sure the farm is running smoothly; Paula has administered all of the farm’s record-keeping since day one. Laurie, the oldest of the three children, works in the office as the Human Resources Director and keeps track of all production records as well as the accounting. Mike is the middle child who oversees the entire operation, including pig production and risk management. The youngest child, Matt, manages the feed mill, a new addition to the farm, which comprises one of his greatest projects. As their children take on larger roles in the operation, Greg and Paula’s roles are fading and they are becoming the consultants for their children. It’s no secret giving up responsibilities and control on the farm can be difficult for many farmers, but the Boerbooms have great confidence in their children and the direction they are taking the farm. Not only have the Boerbooms proved to be an industry-leading family on the farm, but they are heavily involved off the farm as well. “We have tried our best to expose our children to all of the different ways they can get involved in the industry, rather than encouraging them to be a part of an organization,” Paula stated. Not only do the Boerbooms encourage their children to volunteer at industry-related events, but they urge the rest of their employees, too. “Our company is very involved at the county level. We have donated a sow and litter to our county fair that is later donated to an FFA kid, we’ve helped host county grill-outs, and we put on multiple farm tours every year,” Paula added.